The Atik 314L + represents the pinnacle in medium resolution cooled astronomy cameras. This camera is based on the highly successful Atik 3 platform, which features state-of-the-art technology for supreme performance and ease of use. In addition, the 314L+ has full set-point temperature regulation making it easy to take matching dark frames. software-controlled cooling for automated operation. Like its brother, the Atik 314E, this camera draws on all the advantages of this popular and highly successful platform. 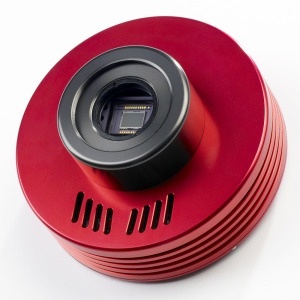 However, the Atik 314L also incorporates an exceptional Sony ICX285AL ExView 1392 x 1040 sensor with larger 6.45µm pixels, making it suitable for use on a wide range of telescopes. Readout noise is typically 4 electrons rms, making this an extremely sensitive camera. Data download takes only 1.8s for a full-frame readout, or 0.9s in preview mode. The Atik 314L+ has exceptional linearity and low noise, making it ideal for recording scientific data. It has been used by amateurs and institutes worldwide to record a diversity of events, like exoplanet transits, solar corona studies during eclipses, and NEO surveys.